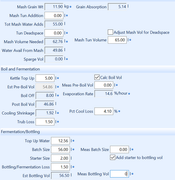 I have a Braumeister 50 and I want to produce a 56L batch at 1.050 so using the Vol tab in Beersmith I have configured water additions at pre-boil and pre-ferment. I mash with 55L water and 11.9Kg grain. At the end of the mash I add 5L water to achieve 1.053 which according to Beersmith, that will give me a pre-boil gravity of 1.053. I then boil for 60 mins and during this time, 8L wort will boil off. Beersmith says that the gravity will reduce to 1.050 which puzzles me because if I boil off 8L of water I would expect the gravity to increase. Beersmith says that my post boil gravity is 1.050 which is what I want my final value to be but I've still got 12.56L water to add so that's going to cause the gravity to plummet. It doesn't really matter that I'm using a Braumeister, it's more the fact that I don't see how the calculations make sense. BeerSmith tracks the amount of sugar and the volume balances separately. When you set up your equipment profile, you specify the amount of sugar from the wort which makes it to the fermenter when you set the brew house efficiency (in your case 75%). Regardless of your boil off rate, amount of water you add post mash, the program assumes you will always achieve 75% of the total sugars from the grain bill into the fermenter. Now, looking at your brew sheet and volumes tab, your boil off rate means nothing to the computer, since the amount of sugar is a constant. The more you boil off, the greater the volume of strike water and the greater volume you will pull from your mash to accommodate for this volume loss. Your fermenter top off, however, dilutes down whatever concentration of sugar from the mash and boil steps down to the fermenter. In short, when BeerSmith gives you an 'end of boil gravity', it is actually this diluted value which makes it into the fermenter and not the actual end of boil gravity which you will then dilute down.